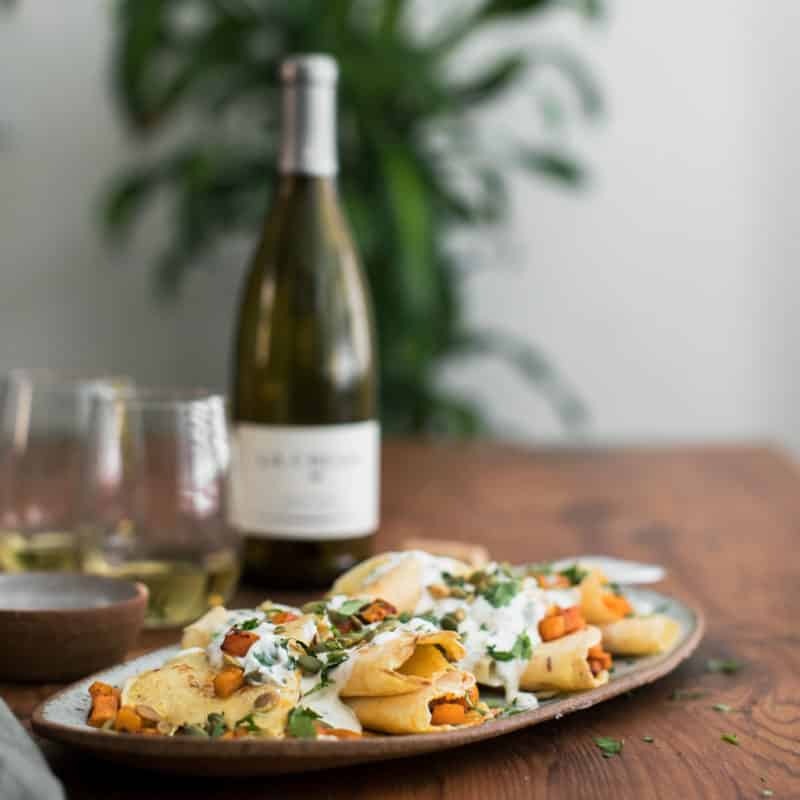 Chipotle Butternut Squash Crepes with Cilantro Crema | Naturally. With the time change, our weekday dinners become a bit cozier. It’s dark by the time we eat and the temperature has dipped to the point of craving a hot, filling meal every night. These butternut squash crepes have hit the spot numerous times recently. 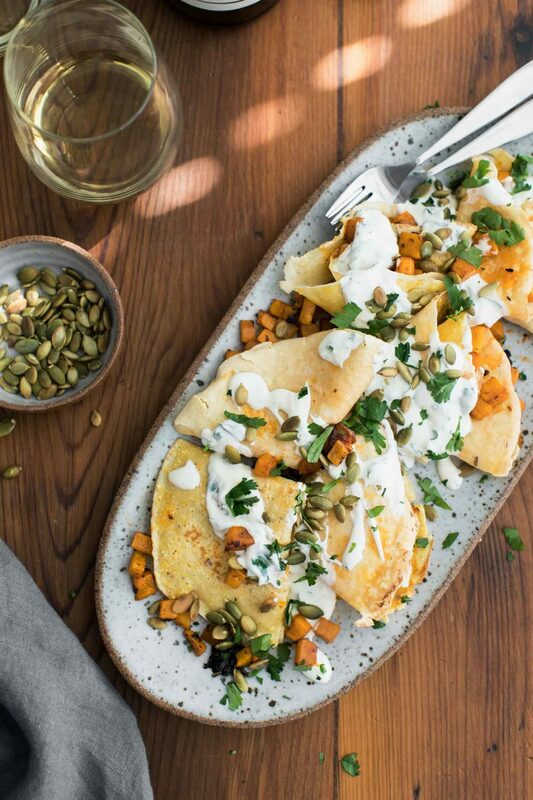 The slightly spicy squash is stuffed into cornmeal crepes and topped with a cilantro-crema. 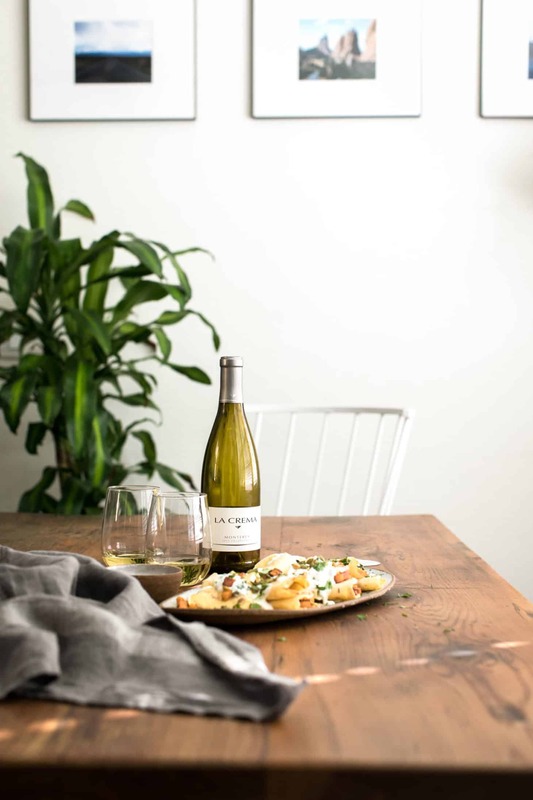 Paired with a lovely glass of La Crema Monterey Chardonnay– it’s a perfect, complete meal. A couple notes: you can go one of two ways with the crema. If you can find Mexican crema at your grocery store, go that route. However, I know not every store stocks it and because of that, I’ve included a stand-in replacement. Either are delicious. Also, I’ve started making my own chipotles in adobo sauce with help from the recipe in Nopalito. This book is inspiring and I can highly recommend getting a copy. 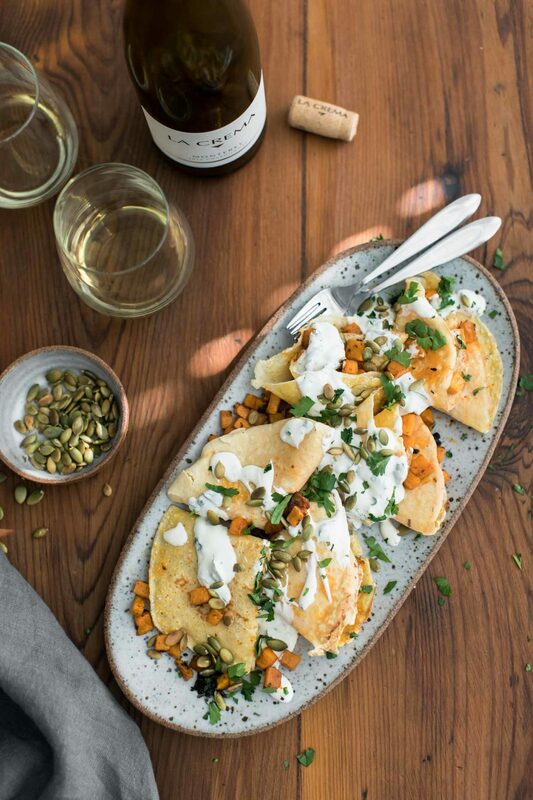 A delicious savory stuffed crepe recipe featuring spiced butternut squash, cilantro crema sauce, and toasted pepitas. Preheat oven to 425˚F. Place the cubed butternut squash in a roasting pan and toss with the crushed chipotle pepper, adobo sauce, garlic, olive oil, cumin, and salt. Squash should be well coated. Roast until tender, 30 to 40 minutes. While the squash is roasting, make the crepes. In a medium bowl, whisk together ingredients for the crepes. Heat 8″ skillet and lightly grease with oil. Place a scant ¼ cup of batter in pan. Tilt the pan so that the batter covers the entire pan and cook for about 60 seconds or so, until golden. Flip and cook for another 30 seconds. Layer done crepes, slightly overlapping, on a plate. Assemble the crema by whisking together the sour cream, heavy cream, cilantro, and salt. When the squash is done. Take a crepe and fold in half then half again. Stuff the butternut squash inside each crepe and place on a plate, repeating for each crepe. Drizzle with the cilantro crema and top with toasted pepitas. Serve with lime wedges. Tips & Tricks: If you can find Mexican crema- go that route. The recipe above is an acceptable substitute but not quite the same. These crepes are beautiful and easily adaptable. Swap out the squash for another fall produce, add legumes, or make the crepe vegan. So many choices- so few dinners! Sweet Potato: Swap the butternut squash for sweet potatoes or use both. Legumes: Bulk out the recipe a bit with the addition of black beans or black lentils. 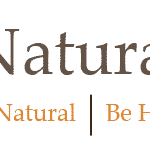 Vegan: Drop the crema and make a sunflower, pumpkin seed, or cashew sauce with cilantro and use a vegan crepe recipe. Mmm I would pay good money for these. Now I can make them, thanks to your recipe – thank you!